The classification of various Verticillium species, such as Verticillium depauperatum, Verticillium rubrum and Verticillium serrae in the genus Verticillium remains doubtful and uncertain. Some authorities feel that they should be included in other genera . Verticillium is a widely distributed filamentous fungus that inhabits decaying vegetation and soil. Some Verticillium species may be pathogenic to arthropods, plants, and other fungi. It is commonly considered as a contaminant. Verticillium may very rarely cause human disease. The genus Verticillium has four known species; Verticillium affinae, Verticillium albo-atrum, Verticillium fusisporum, and Verticillium luteoalbum. See the list of active names and synonyms for Verticillium spp. Verticillium has been reported as a possible cause of keratitis in humans [1295, 2202]. 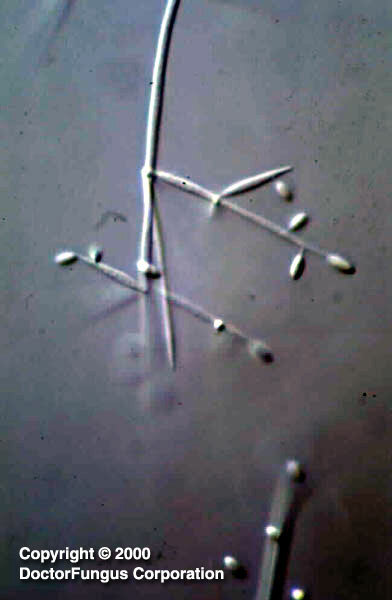 Colonies of Verticillium grow moderately rapidly or rapidly. At 25°C and on potato dextrose agar, the colonies are velvety to wooly. From the front, the color is white initially and becomes yellowish, red, pinkish-brown, or green. From the reverse, it is white or brown (rust color) [1295, 2144, 2202]. Septate hyaline hyphae, conidiophores, phialides, and conidia are observed. Conidiophores are hyaline, simple or branched. The branching of the conidiophores occurs in whorls (=verticillate; resembling spokes in a wheel from a central axis) at several levels. Conidiophores bear the phialides. Phialides are very long and are also arranged in verticils (whorls) around the conidiophore. Verticils may be disrupted in slide culture. The apices of the phialides are pointed. Conidia (2-13µm in length) are hyaline or brightly colored, one-celled, and oval to pyriform in shape. They are solitary or form clusters in sticky heads at the tips of the phialides [1295, 2144, 2202]. Verticillium differs from Acremonium by having not solitary but whorls of phialides and branches. Very few data are available. Per these data on very limited number of isolates, amphotericin B, ketoconazole, itraconazole, and voriconazole appear active in vitro against Verticillium spp. .
For MICs of various antifungal drugs for Verticillium spp., see our N/A(L):susceptibility database.